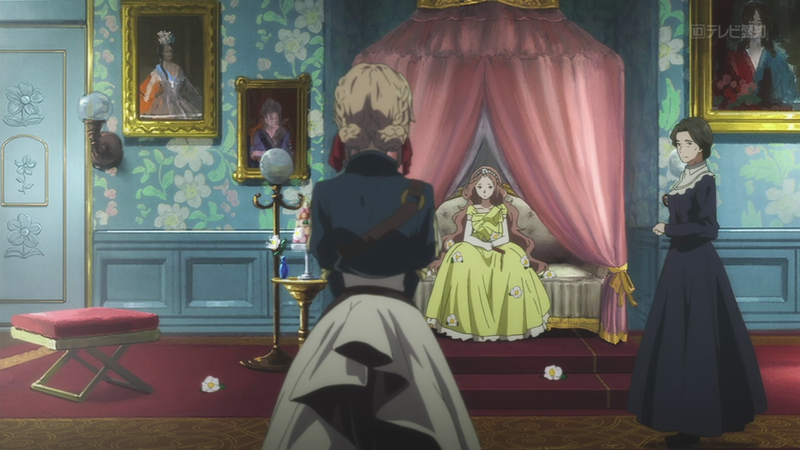 From Episode 1, Violet Evergarden has relished in Victorian-era trappings. Its concern with flower language, and Victorian floriography began in earnest during Episode 2 thanks to Haruka Fujita’s careful direction and continued through Episode 4 with Iris Cannary talking about the iris fields near her childhood home that became her namesake. In the series’ fifth episode, we see floral messages put into literal action through Naoko Yamada’s storyboards. Yamada previously employed floriography as another, unspoken form of communication throughout the film A Silent Voice. 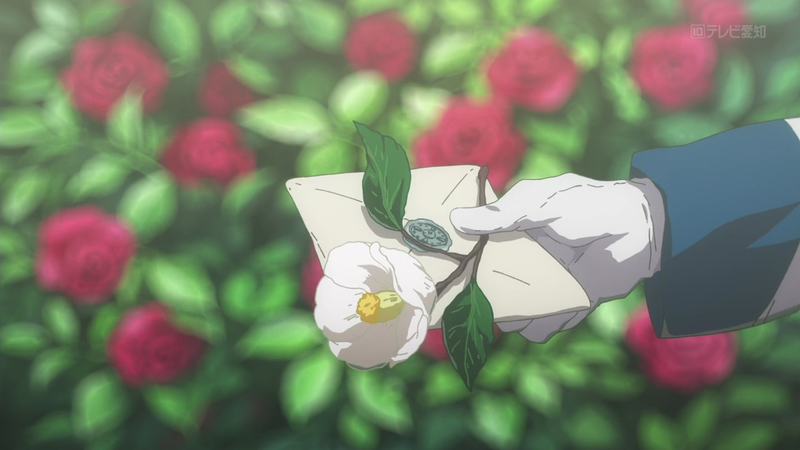 In her episode of Violet Evergarden, flowers are exchanged along with love letters between the heads of two kingdoms. Each kingdom is also represented by a specific flower. 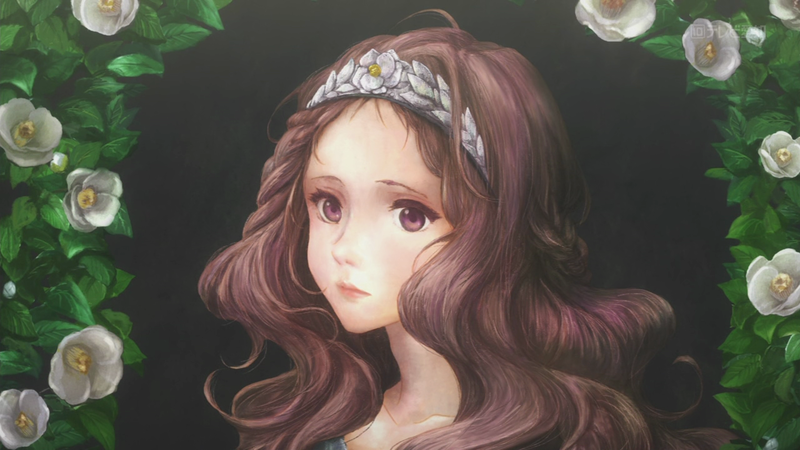 Charlotte Abelfreyja Drossel is the princess of Drossel, the White Camellia Kingdom. The flower is everywhere around Charlotte, from her crown, to carvings on her doors, to her wallpaper, to her gardens, to strategically-placed decor in her room like a tower of macrons, to fresh camellias scattered at her feet and on her person wherever she goes. Without beginning to delve into the various outside meanings of camellias themselves, to Charlotte, they already represent her duty as a princess to her kingdom, including her upcoming marriage. At times, they smother her. She repeatedly takes off her camellia crown when she wants to be honest or is struggling with the weight of responsibility. In all of these instances, camellias are still present, in vases like the image above, or on her person and in looming garden shrubs. 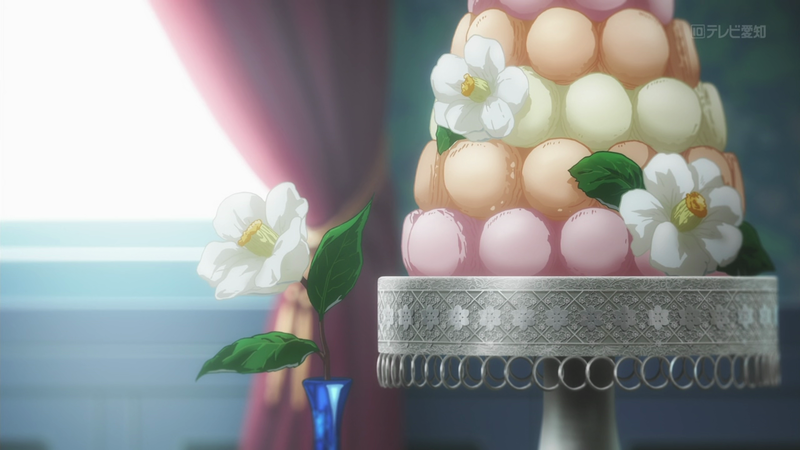 Camellias take on a variety of different meanings for Charlotte throughout the episode which is in line with how flowers were used throughout the Victorian era. Flowers were given as gifts to convey a message that could not be expressed publicly in words, and meanings changed depending on who was receiving the gift and with what other flowers or objects it was given. Violet’s task in this episode is to aid Charlotte in a longstanding Drossel tradition of writing public love letters to her affianced — in her case, this means Prince Damian Baldur Flugel of the Flugel Kingdom. The first letter is appropriately flowery (mind the pun) including mentions of the flowers and the moon as required, but to Charlotte they mean nothing. Her response from Prince Damian is equally verbose and cold, leading Charlotte to confide in Violet that what she wants, more than anything, is to genuinely express her feelings and know Damian’s true feelings in return. The series only begins to show flowers exchanged with the letters once both parties drop their ghostwriters — Violet for Charlotte and Cattleya Baudelaire for Damian — and begin writing to each other in their own, less-embellished words. The kingdom of Flugel is represented by a red rose, while Drossel is represented by the aforementioned white camellia. The Victorian message of a white camellia can mean anything from “you’re adorable” when given as a gift, to a representation of purity, love between a mother and child, and luck. Charlotte is only fourteen, yet shoulders the burden of representing her kingdom as well as her own feelings throughout these exchanges. In Japanese hanakotoba, a white camellia means waiting, an appropriate message to Damian, whom she met when she was only ten years-old. A red rose, now a near-universal symbol for love and passion, meant both love and respect in Victorian flower language. This is again appropriate for Damian, who gained a unique respect for Charlotte as a child for wanting to escape her own birthday party, and later comes to her with an in-person proposal after she challenges him in a letter, chiding him for looking down on her. There’s a sense throughout that both are fighting back against certain social expectations despite the fact that both are entering a mutually-beneficial political arrangement, especially since these letters are still being read aloud to each kingdom’s citizens. At first, the peanut gallery is confused at the lack of prose between the two, but quickly becomes enthralled with Charlotte and Damian’s awkward love story, yelling advice at their newspapers. There’s a sense that this simply isn’t done in the world of Violet Evergarden, especially with both auto memoir dolls taking a backseat role, encouraging their charges without writing for them directly. Again, this is another nod to Victorian-era communication, where certain things just were not said aloud due to their impropriety. In Charlotte and Damian’s case, kingdoms are on the line. 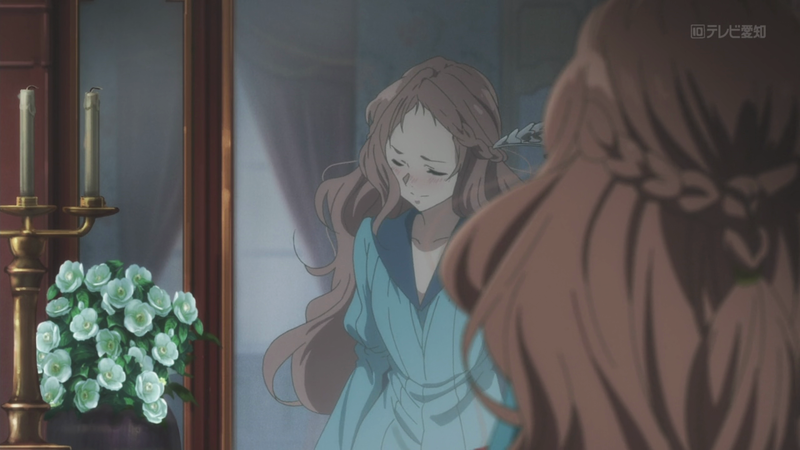 Returning to the white camellia, there’s a secondary narrative in this episode that involves Charlotte and her maid, Alberta. Alberta has watched over Charlotte since she was a baby, and has become a mother to the princess. The white camellia also represents a love between a mother and child. 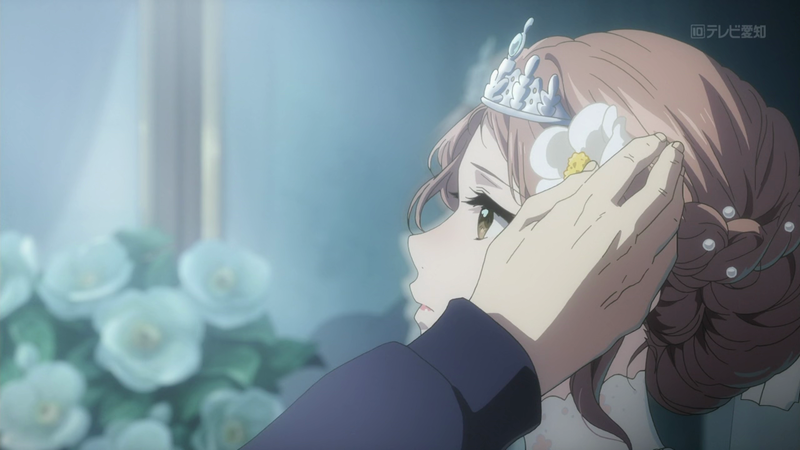 This makes Alberta’s parting gift of a camellia flower in Charlotte’s hair — something she has likely done countless times throughout Charlotte’s life — to complete her wedding outfit all the more affecting. The analysis was really good. As a person who knows nothing about floriography, I find it fascinating that flowers can have so many different meanings when used in different scenarios. 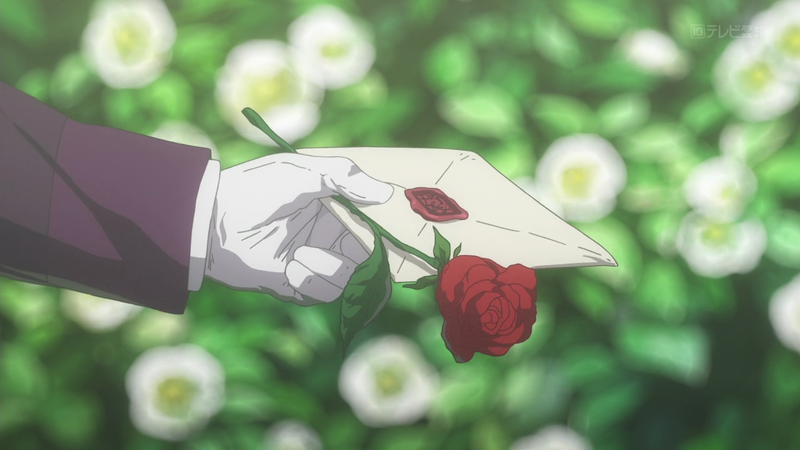 I just finished Violet Evergarden’s latest episode (episode 10), and a flower I saw in the last few minutes of the episode piqued my interest. It was a yellow flower, which represented death and parting (I know this much). I couldn’t find what flower it was, and I just wanted to know what its name is and what other meanings it could encompass. Sorry if this seems trivial. Love your work and hope you keep it up! Hello, there. I encountered your blog by chance after looking to see if anyone else had written about the use of visual language in Violet Evergarden. I find your writing and analysis very much enjoyable, so I’ll be following your blog from now on.